gloves for the text generation. « to 2011 ... and beyond! I suppose that the cold weather is (hopefully) almost behind us, but that by no means does that work slows down here at the twittens HQ. In fact, we're working harder then ever to ensure that all of you can get you hands on (and in) twittens as easy as possible. I'm delighted to announce that not only is the twittens online store now open for business but I've just updated the section that let's you know where you can buy twittens at a store near you with a whole bunch of new retailers! 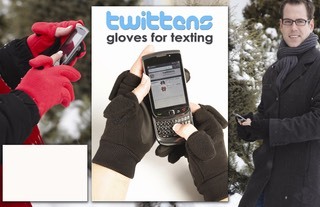 Clearly the push now is to get twittens stocked at a store near you as soon as possible. I'm delighted that a number of university and college bookstores are now carrying twittens, which makes sense considering I was walking around campus when the idea came to me. Don't see yours on there yet? Not too worry - many more have already ordered for fall 2011. As well, I am hopeful that a major retailer will be on board shortly. There are clearly a lot of people that are smitten with twittens. I would be remiss if I did not take a moment to thank the 'manufacturer' of twittens, IMPACTO. It is only fair to put the term manufacturer in quotes as they have really stepped up and are absolutely critical to the success twittens have become. I want to take a moment to personally thank you - you guys are simply the best! Do you love your twittens? How do YOU use them? Please take a moment to stop by our Facebook page and leave us a comment or share a picture of your twittens in action! I'll stop by in a little while to share all the twittens-related news that's fit to print. In the mean time, stay warm & all the best! twittens is a Canadian trademark of�Lincoln McCardle�All other brand names & logos are trademarks of their respective owners. Patent pending 2010.